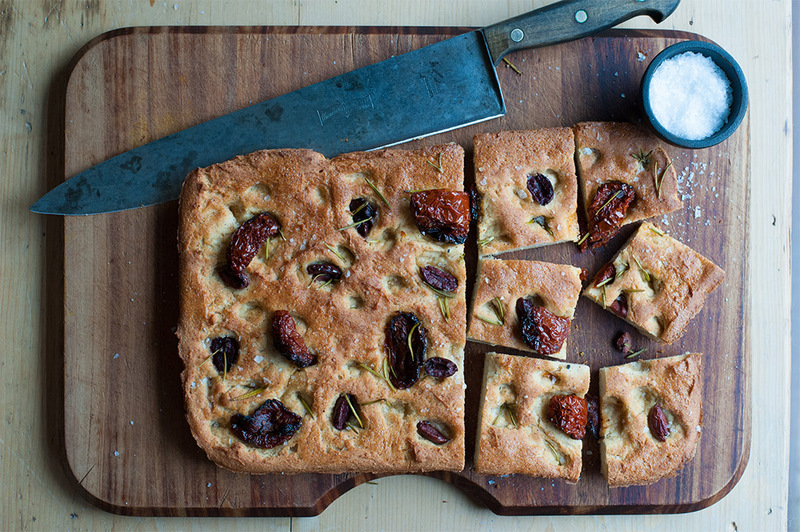 Focaccia is a popular Italian flat bread and it’s one of the things I missed when I went gluten free last summer. 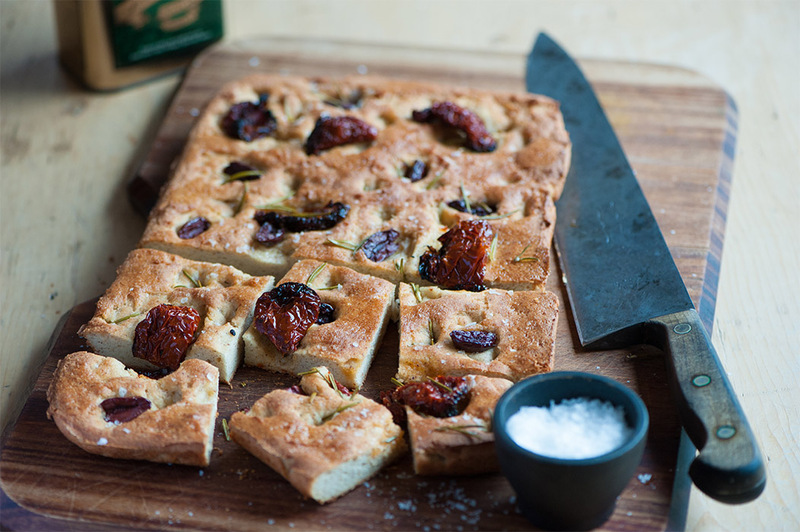 Luckily, several years ago I took inspiration from Leslie Collins and Adriana Rabinovich, who both cook for coeliacs, to create a delicious GF focaccia recipe using Thermomix – grinding the flour freshly makes such a wonderful difference to the flavour. Since then I have been learning more about the proper preparation of grains, legumes and nuts from Sally Fallon Morrell, author of Nourishing Traditions, so now I soak the freshly ground flour and leave 6 hours or overnight before finishing the recipe and then it tastes even better. 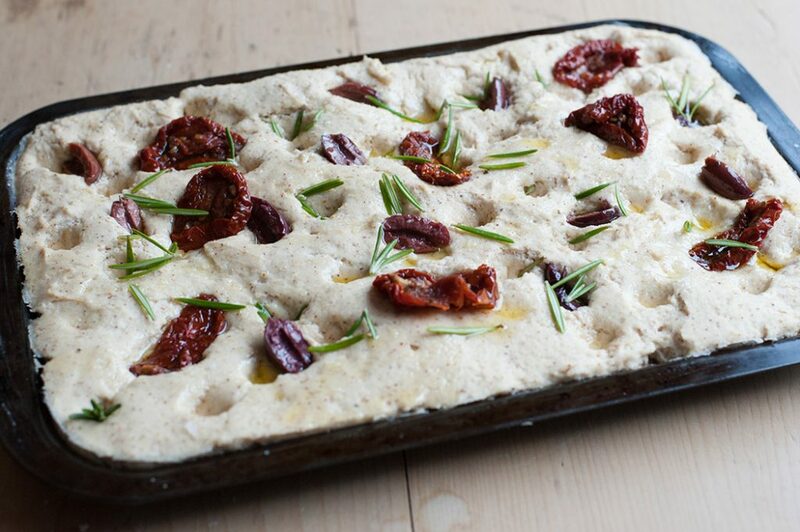 Everyone loves this focaccia at our barbeques and parties, and we’ve received lots of compliments – I hope you do too! Grind basmati rice, brown rice and chickpeas 2 min/speed 10. Add almonds and grind 30 sec/speed 10. Scrape down sides and base of TM bowl with TM spatula, add 270 g water and 30 g whey then mix 20 sec/speed 3; transfer to a bowl and cover bowl with a plate (or leave in your covered TM bowl if you don’t need it for something else) and set aside 6 hours or overnight. Add potato flour, xanthum gum, sea salt, honey, yeast, 50 g olive oil and remaining 100 g water, then mix 20 sec/speed 5. Grease a 20×30 cm baking tray with olive oil, spread dough evenly on tray using TM spatula dipped in water. Set aside to rise in a warm place 30-60 minutes or until dough looks a bit puffy and slightly risen; meanwhile, preheat oven to 200°C/400°F/gas 7. Sprinkle dough with one or more toppings if using. 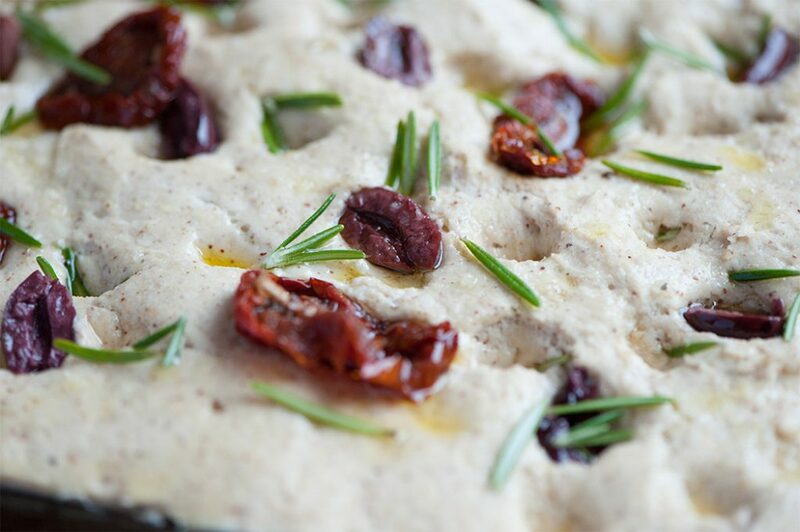 Dip your fingertips in water then press into dough all over to make little dimples – this creates the traditional appearance of focaccia, and if you’re using toppings it helps them stick to the dough. 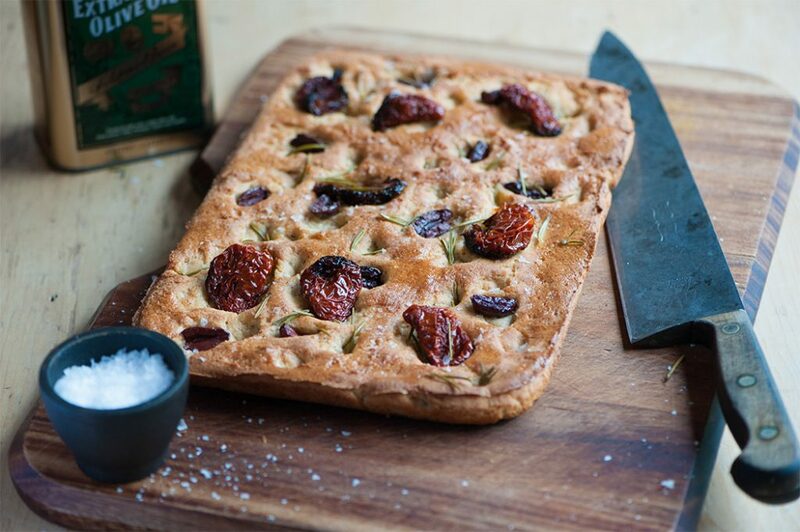 Drizzle top of focaccia with 1-2 Tbsp olive oil, sprinkle with sea salt flakes, then bake 20-25 minutes until golden with browned, crispy edges. Aga ovens: bake 18-23 minutes on rack on floor of roasting oven. Remove from baking tray and immediately check if fully baked by tapping gently on underside of bread with your knuckles – it should sound hollow; if not, return to oven for a few more minutes to finish baking. Allow to cool on a wire rack then cut or tear into chunks and serve. This is a very flexible recipe – if you’re in a hurry, feel free to replace some or all of the rice and chickpeas with a bought variety of GF bread flour such as Doves Farm (in UK), however it does taste best when you grind the flour fresh. Freeze leftovers for up to 1 month. Refresh in a hot oven until hot through, then cool on a wire rack and serve.